This course is currently being offered as a self-study. The next interactive course will be offered in 2018. Ongoing. This course is currently being offered as a self-study. The next interactive course will be offered in 2018. Weekly PDF workbooks, live Q & A and video lectures. I am passionate about creating spaces for women to be vulnerable and connect and express themselves. Contact me to discuss bringing one of my in-person workshops to your event or group. "First, I want to thank you for putting this beautiful course together. When I saw that you were offering a course which centered writing around self-care I was quite excited to sign up. One of my goals this year is to get back into the habit of journaling. I found all the information and resources you have provided quite valuable. What I loved the most is your focus on writing as self-care and as a spiritual practice. This has really resonated with me as I've always felt the most connected to God whenever I would sit down to write. And writing was always a cathartic experience for me. I've never taken a writing workshop online so I really didn't know what to expect, I just knew that I needed to follow my desire to be more intentional in using my writing and healing as apart of my self-care. I really enjoyed the writing prompts and the wisdom you share, you gave a lot of great resources that I know I will put to use. 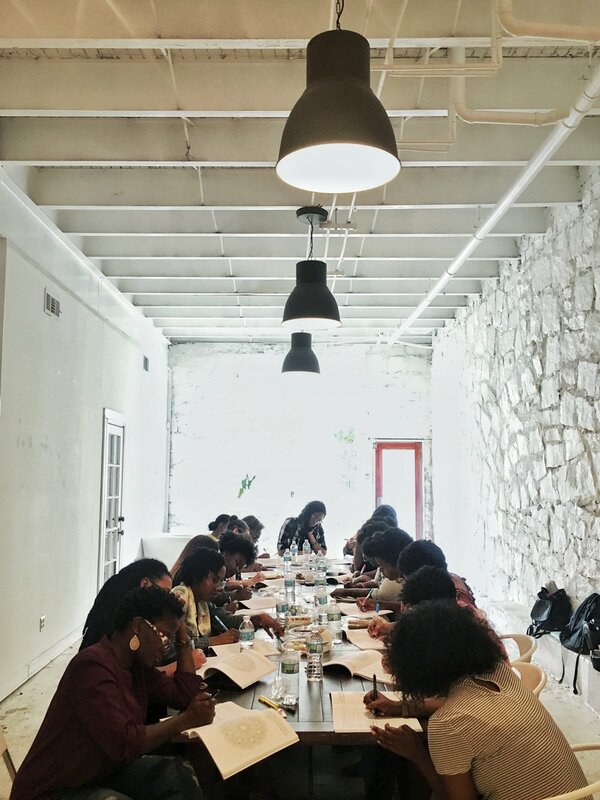 I attended one of your writing workshops in DC last year, which was great by the way and I definitely like having a space to sit and share with others and look forward to future writing workshops you may have. "I really enjoyed the Words that Heal class. The prompts in the assignments really make you think and dig deep within your soul with your feelings and emotions. GG challenged us to not judge our writing; but to simply just write and not to go back and change what we said. To go with the flow of what's in our hearts as we write. GG's Words that Heal class gives you a deeper perspective of yourself and mental self care awareness. She wants to heal. She wants to do something creative with the pain, the rock bottoms, the challenges, the dreams and the nightmares. She doesn’t want to feel like a victim any longer. She wants to own her setbacks, be bold with her scars and wise with the lessons she has learned. She wants to feel free to take up space and add beauty to the world through healing. She wants to redefine her struggle and disprove all the limiting ideas she has ever believed about what she can or cannot do. She wants everything she’s been through to mean something and be used for growth and enlightenment. You don't have to be an experienced or professional writer to benefit from the healing process of writing. Many of us have the desire to write, but we don't necessarily see it as a vital form of self- care or a spiritual practice, so we don't prioritize it. We underestimate the strength that can be found in vulnerability and the value of excavating our personal wisdom. Writing helps us sort through difficult feelings, admit things we are afraid to say out loud, discover the power of our authentic voice, find purpose in our stories, leave a creative legacy and more. These are just a few of the curative benefits of the craft. While the idea of writing is appealing, the resistance we feel when we sit down to do it can be daunting. We fear the blank page and the soul searching work we must do to fill it. We expect that our words will disappoint us and we're afraid to see our secrets in sentences. We talk ourselves out of doing the work and instead, we carry around the frustration of unexpressed truth and unresolved emotions. These unresolved emotions include guilt, shame, fear, regret, and other shadows, but they also contain our greatest gifts. Writing creates a portal to spirit, it translates complexity, and we often don't know what wisdom we are holding or what to do with it until we surrender wholeheartedly to the process. Writing can be therapy for everyone, not only a chosen few. We will break down the two requirements that must be present for the words we write to have a healing and calming effect over our lives. And what about answers? Many of us believe that if we don't have them, we don't have anything to write about, but this is not true. This week, we explore the short and long term effects of writing and not writing when we have unaddressed pain. Also, we'll dig into the one thing we all want to change and can change through writing. We think we need to be brave to write the raw truth but it is the writing that makes us brave. This week is about what to expect when we start to write about difficult things. We investigate how writing deepens our capacity to both manage pain and access joy. Through a series of examples and exercises, this week will reveal the beautiful gift that many of us think we are missing and why. Plus, the best way to boost your courage when you begin to doubt your efforts. Most of us underestimate the inherent power and personal wisdom that we carry with us through life. We don't trust ourselves because of our mistakes, weaknesses and the damage we've endured through our journeys. This week is about how we write meaning into the gaps that we'd rather hide and avoid. Beyond the story we've always told ourselves about who we are, what we've been through and who we can become, there is another version waiting to be written. We will explore the idea of co-creation and the neglected source of transformation that can change the role we've played in our past, present and future experiences. It was Audre Lorde who said, "You'll always have the pain, you might as well use it." We must help ourselves. The choice to heal must be followed with action. By writing with intention and developing a consistent routine, we are nurturing a healthy, resilient lifestyle and that by itself, is a valuable way to process pain. To add to that, the more we commit, the more we enable the healing potential and growth in our writing. This week's exercises walk you step by step through the process of developing your own guiding principles for writing so you can create a unique process that works seamlessly just for you. I found your writing workshop really useful in that particular time of my life. I was/still am hurting over a break with my first adult love and I found all your exercises self healing and allowed me to clearly express my emotions on paper. I learnt the power of pen to paper rather than just typing. It introduced me to writing a journal which again really helped me understand how I'm feeling and also be able to just leave it be once written on paper.